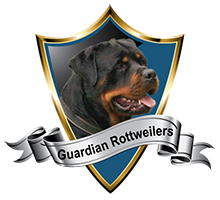 At Guardian Rottweilers we are strong proponents of feeding our Rottweiler adults and puppies natural food, also referred to as a biologically appropriate raw diet. In essence this means that the dog should eat what it was designed to eat living in a natural environment. The starting off point is to acknowledge that the dog’s nutritional needs are no different than wild canids such as a wolf. Think of what a wolf would find to eat, its diet consists mainly of prey animals ie. muscle and organ meat, fat and bone, and the semi digested stomach content of those animals. Living in Miami South Florida affords many possibilities for acquiring raw food. Here you see our Rottweiler puppies indulging in their first whole raw animal, a squirrel. We start weaning puppies with a natural formula consisting of goat’s milk, egg and yogurt, gradually adding ground beef until they’re ready to tackle their first whole animal parts. Normally this will be chicken leg quarters. In this case there was a squirrel on hand and that’s what they got. There wasn’t much to go around, but puppies need each other to break up prey animals into smaller more manageable pieces. This is done through a competitive “tug-of-war”, Rottweiler puppies take to it quite naturally. Remember there are no cooking facilities for animals living in the wild, so meat should be fed in raw form. Whenever food is cooked it loses nutritional value. Food cooked in certain ways such as frying, becomes completely useless to the dog nutritionally. Dogs will fully digest soft bones like chicken bones, break larger bones into manageable pieces and digest those as well . When bones are cooked/exposed to heat they become brittle and indigestible. Brittle cooked bones may splinter and cause damage to the dog’s digestive tract. There are many other benefits to feeding your dog a raw diet. Commercial dog foods, we’re talking about the little brown pellets, contain the lowest quality ingredients even if their marketing says otherwise. The dog food companies only include animal products that absolutely can’t be used for human consumption, and add fillers such as grains and rice to augment the volume of the food. Rice and grains are fundamentally carbohydrates which are a nutritional zero for the dog. In fact canids can’t assimilate carbohydrates, this is why dogs who are fed commercial dog food make huge piles of excrement. What you’re seeing are the fillers that the dog’s digestive system could not assimilate and let pass through. These big piles are usually soft, not well formed and hard to pick up, very smelly attracting flies and other insects, and contribute to flatulence. By contrast stool from a dog fed a natural diet is 1/4 to 1/3 the size of stool from a dog fed commercial dog food, and comes out in 2 or 3 compact pellets. These pellets have hardly any smell, do not attract flies, and are easy to pick up. After 2-3 days in the sun the stool turns white, and will crumble into powder when stepped on. It’s in the dog’s nature to use his mouth intelligently. Eating kibble is boring, the dog is restricted to using his mouth for a couple of crunches and a gulp, a routine that gets old fast. The dog has an innate need to exercise his mouth and manipulate food in a variety of ways; holding, carrying, tearing, crunching, gnawing, and sometimes regurgitating. All those things are impossible with commercial dry food. The dog is left with a deep seeded hunger to exercise his mouth in other ways, which it will express through chewing your furniture, shoes etc. Raw fed dogs are much happier in this respect, and are less likely to destroy stuff around the house. After all a big raw bone is way more enjoyable than a piece of wood! It’s interesting and rewarding to watch a young Rottweiler figure out how to deal with new foods such as fish. Living in Miami with abundant fishing opportunities, we love to feed our dogs raw fish. No preparation is required, fish are given to the dog whole and in a matter of minutes all is gone; head, teeth, guts and scales. Watch our dog Rocky do it with a fresh Mackerel. Raw fed Rottweilers are very healthy, have beautiful shiny coats with no skin problems, and no plaque build up on their teeth. Flatulence is rare and the possibility of the life threatening condition bloat/flipped stomach is greatly reduced. Puppies fed a raw diet from the start grow slowly, correctly, and are free of hip and elbow joint problems that plague dogs who have been raised on quick growth “puppy food”. Contrary to what you may think, feeding raw is cheaper and easier than commercial dog food. Chicken leg quarters are the foundation of many raw diets, and cost $0.50/lb at the cheaper markets. A daily portion for an adult dog consists of approximately 2 leg quarters. What can be more easy to find in a pinch than chicken, and what can be less complicated than taking it out of the package and throwing it in your Rottweiler’s dish? There are many other benefits to feeding your Rottweiler a raw natural diet. Please take some time to research the subject, there’s plenty of information about it online. 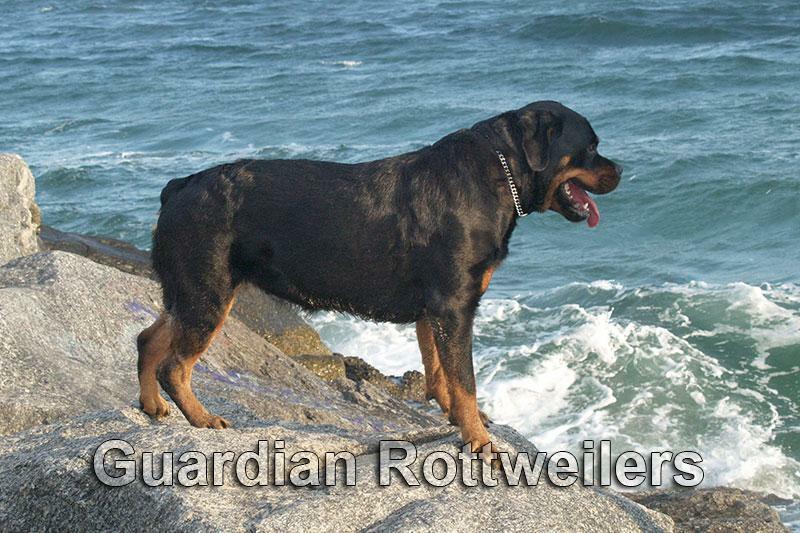 At Guardian Rottweilers all our dogs and puppies are fed a natural diet. We hope that you’ll recognize the benefits of raw feeding and continue it with your Rottweiler puppy.